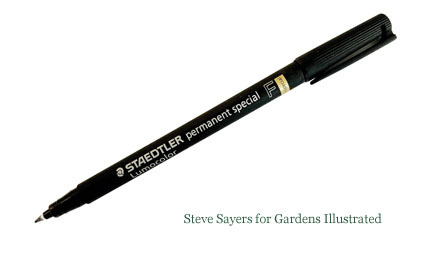 Extra fine black waterproof and lightproof SPECIAL pen for use on plastic, zinc or aluminium labels. The manufacturer - a v.large German Company - claim the writing will last 7 years+ outside. Good for 3+ years in our garden and still going strong. NB These are not the same as the widely available Staedtler Lumocolor Pens for general use(these do not have the word SPECIAL on the barrel). The pen we offer contains extra ingredients to resist the ravages of sunshine/UV light.